There is this super cool site called Roadkill Rescue that it is all about sharing great ideas for recycling, upcylcing, and re-purposing items, many of which normally would be discarded, and making them into something new and useful! I found the site last summer after they found my Nautical Vase made from a plastic pretzel container and featured it on their site. To see that project click here. Well I have been following them ever since and last week they featured this darling candle jar created by a blog named Curly Made. The candle holder is actually made from a spaghetti sauce jar...isn't it the sweetest thing? So I decided to try this little project. 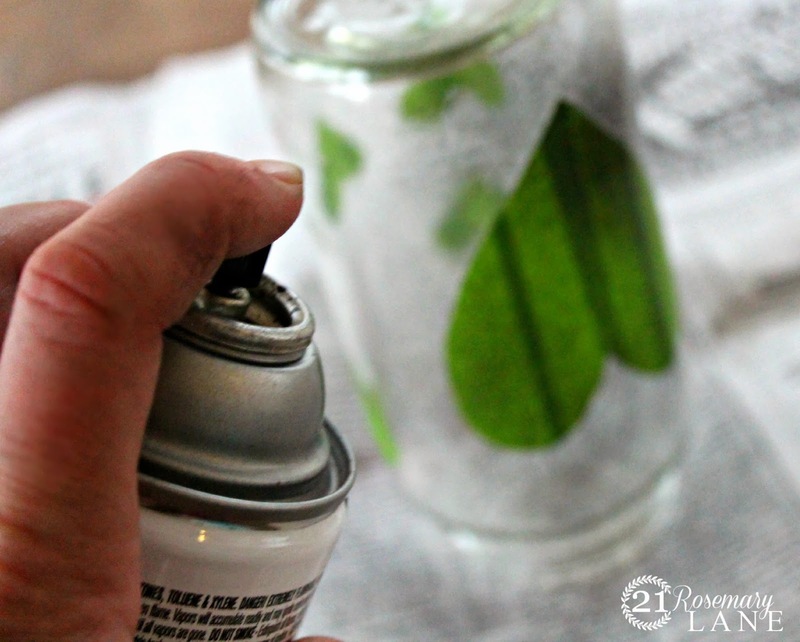 I happen to have several glass jars lying around just waiting for a craft like this one to come along. I did have to make a few trial runs before I got it down, but for just a few pennies in paint and some jars which would have landed in the recycling bin anyway...I thought what the heck if I mess one or two or even three of them up! 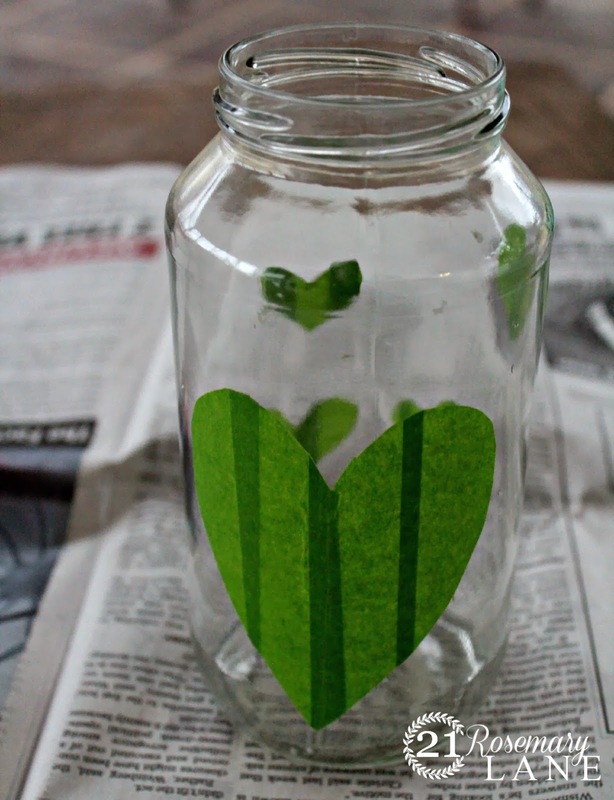 Using a clean jar with the label's adhesive tape completely removed, apply your heart decals. I made mine by taping 4 strips of painter's tape about 3 inches long side by side. Then I folded the tape in half so the the non sticky sides were touching. Beginning at the fold draw a half heart on the sticky side of the tape using a marker or ink pen, and then cut out the heart shape. I applied the heart to my jar and then went ahead and made a few more smaller hearts for the back of the jar. With the first jar I made the mistake of spraying the jar while it was sitting upright...needless to say I ended up spraying paint all over the inside of the jar. Don't do that! Carefully peel off the painter's tape to reveal your hearts. When I did this I found that some of the tape's adhesive kind of stuck to the jar. Using a teeny tiny bit of paint remover (I used Goof-Off) and a Q-Tip I was able to remove the residual glue. Also if you look at the top of the jar below you can see my fingers where I didn't get enough coverage with the paint. 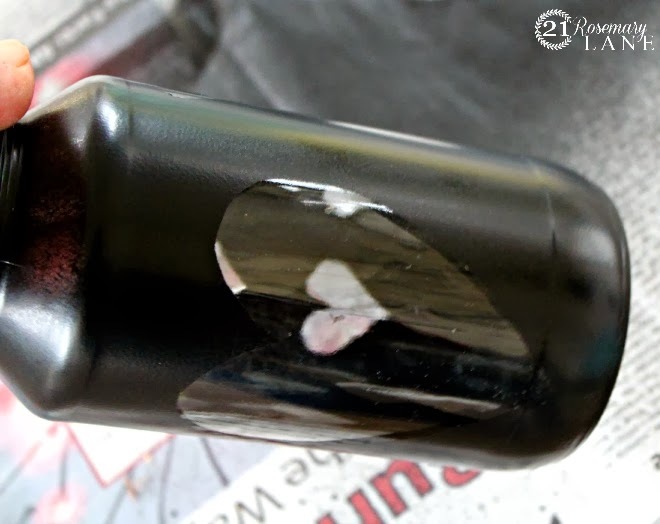 Once the tape has been removed it is hard to correct this problem so really make sure you have good paint coverage before you remove the tape. Using a paint pen or white nail polish, draw your stitching on around each heart. 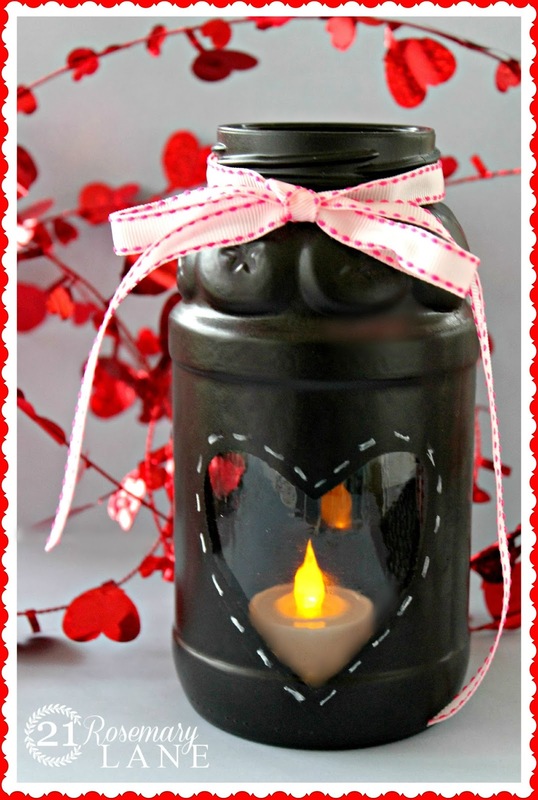 This gives a really cute quilted look to your candle jar. Oh gosh that is so cute Barbara! thanks for talking about my blog. Very cute, Barbara! What a fabulous use for a spaghetti jar! 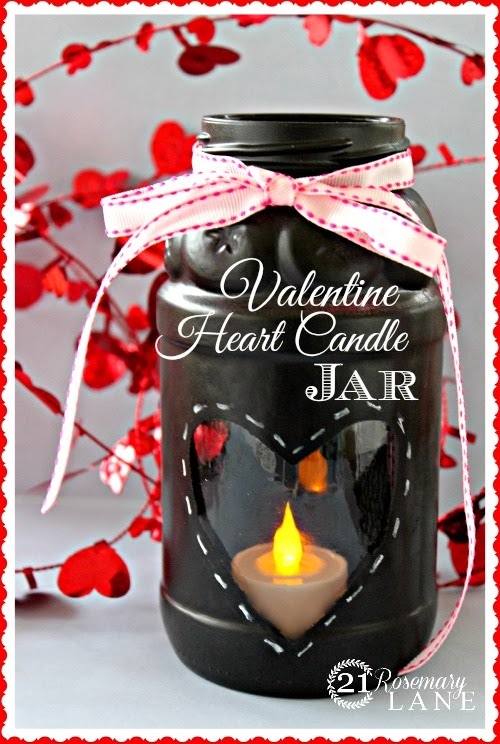 Adorable, gosh we all have jars laying around so this is inexpensive too! So cute Barbara I made some too but yours are cuter. 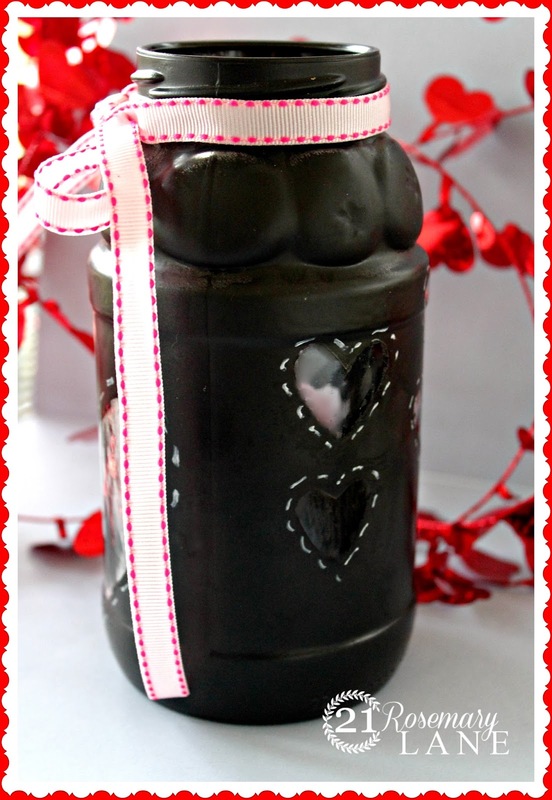 Your Valentines jar turned out wonderful! What a great project. Thanx for sharing the how to at THT.